After leaving Port Augusta after midnight I was gone. Finally I managed to get myself a good on-board sleep. The new drivers kind-of ignored the conversations that the old front-seat lady was trying to have with them until she started to sing quiet songs. I only heard something very soft, couldn�t really understand what it was, but it sure made me comfy in my four seat bed! I would have thrown my pillow to the bus driver when he woke me up, announced our arrival in Adelaide within ten minutes. Unfortunately I did not have a pillow, so he was safe. Grrmpff! The bus arrived in Adelaide around 6.25pm, exactly on schedule. I actually expected to arrive a bit later this day, so I�d spent the rest of the day exploring Adelaide before heading to my first place-to-stay. But now it was still dark and cold on the streets. At the back of the bus a few representatives of the local backpackers were promoting their hostels with small signs. It�s ritual not to harass travellers with smooth-talk so they just stand there. Only the signs would say �This is the cheapest!�, �We are the best�, �Clean and comfy� and �Around the corner�. As they were waiting for more potential guests from other incoming busses I chatted with the guy from the �cheapest�-hostel. He knew about my website when he saw the logo on the back of my jacket. �Looking for a place to stay, fella?� he asked. Well, I wasn�t really, but to stand on the streets for another few hours wasn�t a smart option either. �A little bit,� I answered. Then he got very serious. �You can stay at my hostel for a day, but relax. Don�t write about it on your website.� Huh? What? Aussie, Aussie, Aussie!!! How hospitable! I walked with him, together with a South American man, who � I think � could not quite understand it why I did not have to pay at the reception and he did. �You free?� he asked me when we entered the 4-beds dorm room that we were going to share. �He knows me,� I simply explained and left it with that. At 7am I crawled into that warm bed in that great hostel and decided to have another bit of sleep before exploring Adelaide. I had all the time. So that explains why I woke up about 3 o�clock in the afternoon! Wow, that bus trip had undoubtedly pooped me! I then had a nice shower and got some pancakes for my late breakfast from the chef in the kitchen. I contacted the people who had invited me to stay for a day at their place in Adelaide and the outside suburbs. Dumb me: I had not done that before departing Perth and I had not much phone reception along the road. Fortunately I could catch a few of my upcoming hosts and it was okay that I contacted them on such a short notice. And then I hit the streets of Adelaide. The hostel is located just a walk away from the city centre and from there I walked along the busy King Williams Street and discovered the well-known Rundle Mall. Well-known? Yes, I had heard about it, but only once before. Rundle Mall was created in September 1976 as Australia's first street mall. Just like Perth this city was full of Victorian-styled architecture from the past and I love that. It is sometimes also like walking through a movie set of a country and western town, but this time it was situated with the unusual skyscrapers in the background. Back at the small family-run hostel, I was taken around the corner with the manager who treated me on a filling beef burger for dinner. It was interesting how he didn�t like me to take a photo of him or promote his business. And that was just the way things were going at the hostel. New guests signed in and paid their money for a bed and got their key for the dorms. No deposits, just a friendly welcome. The coffee in the kitchen is free and � see the photo � there were no annoying paternity signs around everywhere and no one was playing the secret police around the huge video collection in the TV-room. How relaxing! Just how it should be everywhere! And they even offered free use of the Internet on several computers to all their guests! That�s like giving a kid free candy, nowadays! Around 7pm a lady from the Laughing Gas Comedy Club from up the road came over and passed around free tickets for tonight�s comedy gig at the club. �Do you like comedy?� she asked me. �What? I am comedy!� I answered over-exaggerated. She got that one positively and offered me two free tickets for the 8 o�clock show! I seemed to be the only one at the hostel who was willing to go, so around 7.30 I walked up the three blocks to the busy and entertaining Hindley Street. The street looked like the spot where it all happens in Adelaide. I got into the Laughing Gas comedy club and had a seat close to the stage (never, never, never do that!) and was immediately offered a beer from the men in black next to me. It seemed I took a seat in the middle of a group of office folks who were quite extending their Friday afternoon drink. And they were a few bottles further than me. And the entertainment began. First the master of ceremony (m.c.) Chris Eagen started up, announcing the line-up for tonight. Soon Eagen got everybody laughing with fascinating stories. Yes I love comedy and there is no way I can really explain the chemistry of the actual evening at that comedy club on this page. You have to be there yourself. The first comedian, I forgot his name, was a great one. It took a while for me to adjust to the Aussie accent he had, but I could easily understand and laugh along with some Australian political jokes and latest happenings in the country. After a break the second one came up, who was less entertaining, but he was a good bloke with one-liners. I only missed the interaction with the public which the last man did very well. When he started about his time in Amsterdam (where he once run one of the first comedy clubs in the country) he was joking around about the Dutch and that made me make an occasional booh!. Of course, with me close to the stage he heard that and soon got up close to me. �You must be Dutch!� Yep. �Why is it why I can�t tell a dirty joke in The Netherlands?� he asked me. 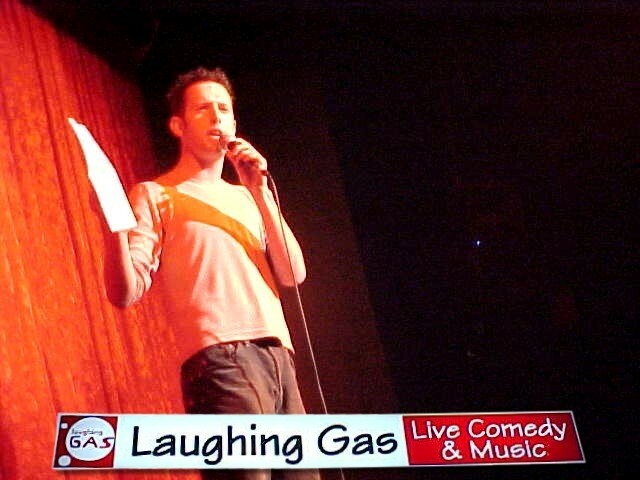 And he had the crowd in the Laughing Gas Comedy Club calling for oxygen! Of course I told him that I have had my arm in there too, one time (not!). �But what you guys do with kangaroos is even worse!� I said and the audience was trying to find their breath back. They loved it. And the guy continued for another 45 minutes, telling how nothing Australia is and how great the United States was. Of course this gathered lots of �boohs� and loud �up yours� (and other most-used Aussie language that I can�t publish here) from the public and that only fuelled him up more. Hilarious! With my cheeks red-hot of laughter I left that place, thanking the people next to me for the six bottles of beer they offered me. After another little stroll along Hindley Street I got back to the hostel around midnight.